Benji and I navigated Rocinante through the labyrinth of coral heads to the sandy-bottom anchorage after a long day underway. With the anchor down, the sail furled, and nothing but bright sun and turquoise around us, we donned our snorkel and mask, and jumped in. As usual, I practiced my free dive a few times. Ben, who is much better than I am, was able to dive all the way down and touch the seafloor. I fell short by a few feet. Next time, though. I’ll keep practicing. We swam over to the anchor to have a look. The chain had moved across the bottom making a ripple pattern in the sand. Interrupting the pattern was a small trail, which we followed to the end. There we found conch dragging himself along, insouciantly unaware that we were hovering so close. I watched for a while as he stretched out his legs, dragged himself a few inches, and tucked back into his house. Benji grabbed me suddenly with a start and I turned around to see what he was pointing at. There before us was a large silver fish about three feet long. It had a big shiny eye staring right at me. I’m not as brave as Ben so I began making my way back toward Rocinante tugging Ben along with me. The fish was gone. I would swim by the boat for a while. That would be better. But, our fish friend was waiting for us at the boat and smartly positioned himself right in front of the swim ladder. I waited, hoping he would swim away. He waited, eyeing me with that polished marble eye. That’s when he bared his teeth. First he opened and closed his mouth showing us two rows of large canine teeth. Then, when that wasn’t enough, he stuck out his lower jaw seemingly dislocating it and expanding his mouth large enough to swallow a healthy grapefruit whole. Open and close, open and close. That’s when chivalry died and it became every man (or woman) for himself. Ben dashed left, and I dashed right. The fish followed Ben as he started away from the boat, then turning suddenly Ben darted back to the ladder and climbed up just as the fish swam past him and directly toward me. By that time I had made it to Rocinante’s stern. Hanging from the solar panel arch over the transom is a long fat rope. We used this monkey vine to climb aboard before we installed a proper ladder. I tried to reach for the rope, but we hadn’t deployed it and instead it laid just out of reach, draped over the stern rail. I grabbed the Monitor steering gear, and scrambled up – swinging my leg over one strut and reaching higher and higher until I was hanging upside-down just above the surface of the water with Big Tooth swimming circles inches below me. “Help me,” I screamed with my snorkel still in my mouth. Ben was now aboard Rocinante and standing over me on the stern deck. “Give me something to climb on,” I burbled though the snorkel. “What,” Ben burbled back, for in our panic he had forgotten to take his snorkel out of his mouth too. I spat the snorkel out, “Hurry,” I shouted as I looked over my shoulder to see Big Tooth still circling close below me. When Ben finally lowered the monkey vine and I was able to climb aboard, we breathed a sigh of relief. I looked in a few books aboard Rocinante and identified Big Tooth as a circumtropical great barracuda, which can grow up to six feet long. They are territorial fish who feed aggressively on other fish by chopping them in half and eating the severed pieces. There are records of them attacking humans, but it is rare. A danger sign can include elaborate head and jaw movements. Maybe he was under the boat to get into the shade and his jaw movement was a tired, uninterested yawn. Or, maybe he was strategically guarding the ladder and awaiting his attack, baring his teeth in a menacing way to show us who is king around here. Until fish can talk, we’ll never know. By the way – we moved 50 miles the next day. 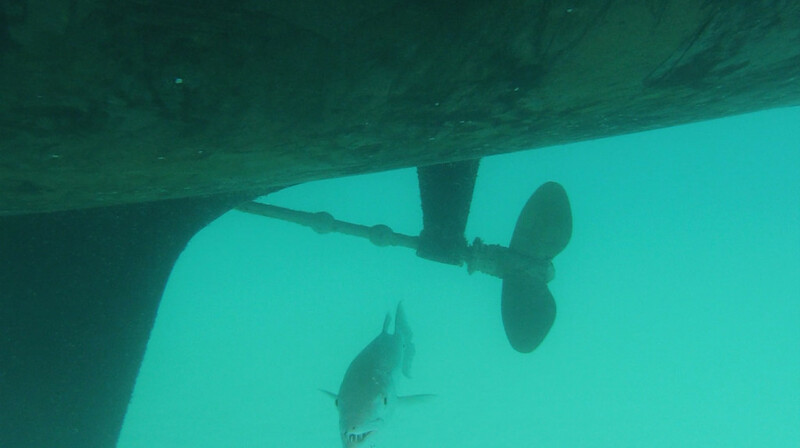 When we set our anchor, another great barracuda was hanging out just under our rudder. Not to worry – we know that most barracuda’s aren’t interested in humans. We’ve swam with them plenty. 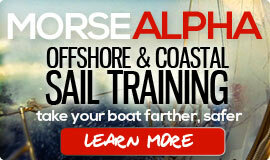 You don’t have to swim with barracuda’s on a Morse Alpha Sail-Training Expedition, but you do have to hurry. 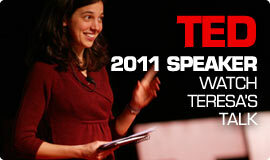 The Early Bird discount is about to expire. Check out our schedule. By the way – you can order a Hello Ocean t-shirt at wholesale prices now. Why so cheap? Because you’ll be helping us meet our minimum order. We need 6 shirts, the minimum order is 25. So we need a few of you to order shirts! Simple as that. Check it out here. 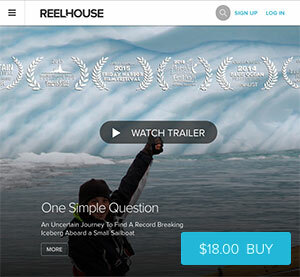 Here is a video we shot with the GoPro – once we got back on the boat. Big Tooth stayed with us the entire day and next day. Yikes, I totally think he was interested in you. Great story, happy that you were able to escape him. Safe travels. 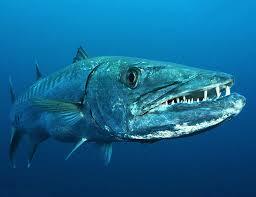 The fangs on a barracuda will give anyone pause about swimming with them. I’ve been around them and even caught a few– then released them. The ones I’ve encountered only become aggressive is when I hook a fish, big or small. I usually end up with half a fish. They have no fear of human but also don’t seem to deem them worthy of their menu. I remember a story from Cousteau ‘s voyages, a barracuda snapped a watch off one of their divers’ wrists once on some atoll. Wouldn’t want to get near these chompers! Yikes! For sure leave the bling on board! Agreed! I think we would be in big trouble if we were wearing jewelry. Nope – just a bathing suit, mask, and snorkel this time. I once saw on TV, someone scraping barnacles off a boat with a stainless steel knife had their arm ripped to pieces… There’s plenty of creatures, big and small, that will have a go once a shiny flash flicks that switch in their little brain. As someone who loves to overthink things…I’m always mindful that at the right/wrong angle the sun will reflect off the glass on a mask! That barracuda looks big! You did well not hanging out much with it. They don’t attack humans, but they are attracted to shiny objects which resemble the fish they hunt. Better not wear rings, watches or earrings when you get into the water. Once, I was in Egypt (I was 12 years old), I put my mask and snorkel on in the water, put my head in and came face to face with a barracuda that was simply sunning itself in about 1.5 meters of water…! I was super scared for a second. Then I realised the fish was simply tanning itself staying very still, so I observed it for a little while and then called my friends to come take a look. I’m not sure I’d be as brave these days. Hehe! This was a great read. Thanks for posting your story!